Salima has lived, worked and traveled on four continents. A lifelong passion for architecture and design has taken her to many places including several wonders of the world and finally led to a career in real estate. With family ties to the Hudson Valley dating back nearly five decades, Salima and her family came from England and settled here in 2006. Her whole family enjoys outdoor sports and feels privileged to live in such a beautiful part of the world. 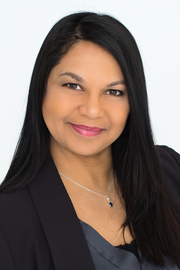 Having lived in Hopewell Junction, Spackenkill, and Highland, Salima has in-depth knowledge of this area and conducts extensive research to stay in tune with the latest developments and trends in both residential and commercial property markets. Salima has a background in the hotel and hospitality industry and values customer service and satisfaction above all else. As a property investor herself with a keen eye for detail and staging, Salima can guide both buyers and sellers to realize the full potential of their property throughout each stage of the process. Salima is a strong believer in giving back to the community through voluntary service and has served on many projects and committees for more than thirty years focused on issues affecting young children, teenagers, elderly, disaster preparation and management, and social integration of ethnic minorities.